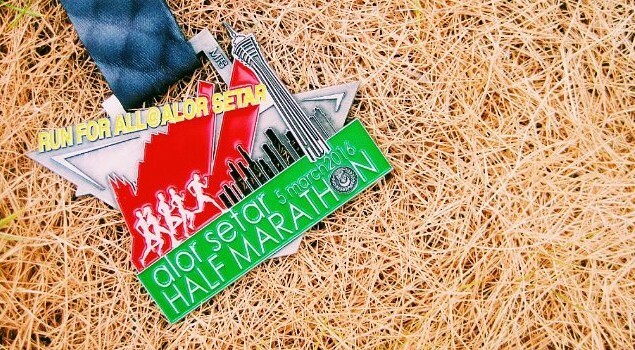 Race Review: Alor Setar Half Marathon 2016 (by Dropthepoptart) | JustRunLah! Departure + Arrival: I took a coach (Starmart Express) which departs SG ( Golden Mike Tower). Yes, since Alor Setar is located in the Northern most state of Malaysia (before Perlis), bus journey took around 9 hours. Excruciatingly long but ironically, it felt fast as I spend most people f the time sleeping. After arrival at The Shahab Perdana Bus Terminal, it was another 3km+ walk for me to the city itself before I could crash into my motel. REPC: Simple and convient. Located outside the Bowling alley in Aman Central Mall. Not too hard to find and it wasn’t congested with other unnecessary booth. 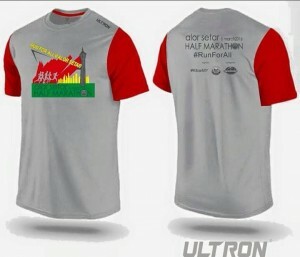 Race shirt. Photo courtesy: Official Event FB page. Photo courtesy: Official Event FB page. 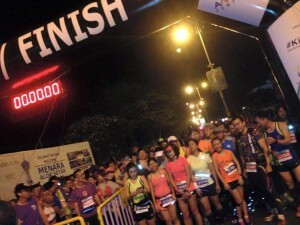 Race venue was located at the base of Alor Setar Tower – just a two minute walk away from my motel. Turnout wasn’t huge but it was good enough although majority were Malaysians (was expecting too see international participants). Smooth flag-off. 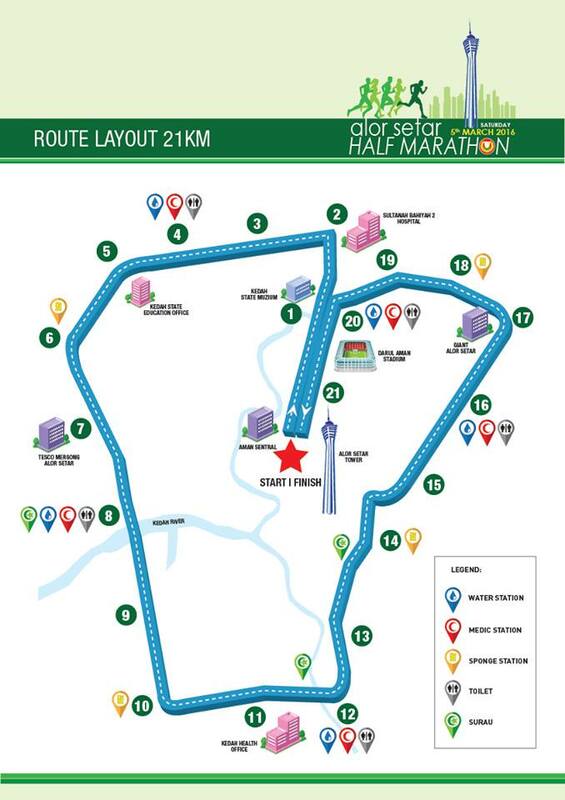 Race route for HM. Photo Courtesy: Official Event FB page. Race route was basically one giant loop around the city. It wasn’t the most picturesque route but the sights of the rural urban environment and the city landmark was refreshing (to me at least). Water point were spread out evenly. But to be honest, the first water point was the only one that’s legit. As the distance progresses, the “water” point although sufficient, was nothing more than isotonics and soft drink station (lemon tea). Yes, hydration issue was a BIG thumbs down but there’s still something to drink (it’s not thirst quenching however). On the bright side, sponging stations were adequate. 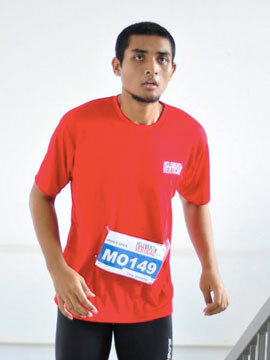 Surau (prayer point) for Muslims runners were spot on. To add on, the traffic marshalls did a fantastic job. Overall, the logistics passed. 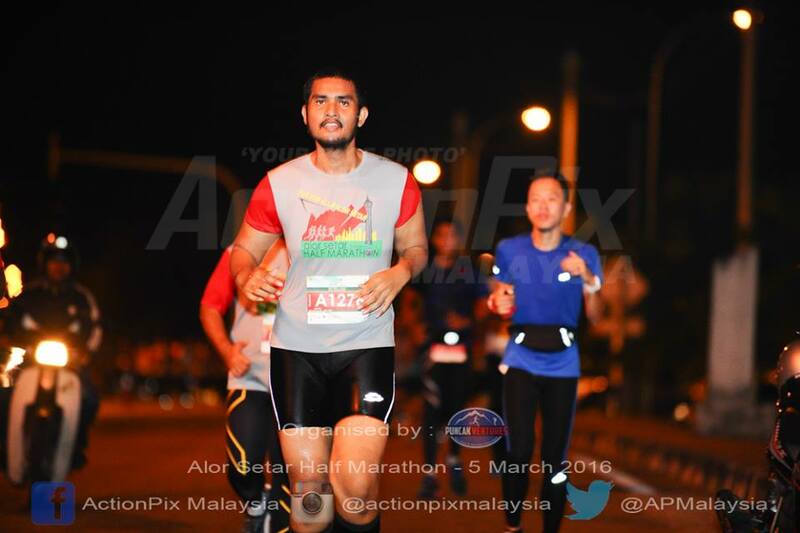 Performance aspect – It was a painful experience for me throughout the race. A week prior to the race, I torn my lower back muscles after a session of Les Mills BodyStep® at the gym. I even considered pulling out of the race. I was lucky enough that the pain subsides after a few days, and being adamant, I still decided to continue with the plan. In the end, I still managed a sub 3 finish despite having to break into walks at certain point. 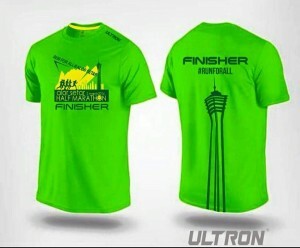 Finisher shirt. Photo courtesy: Official Event FB page. Click here for more post from Dropthepoptart.